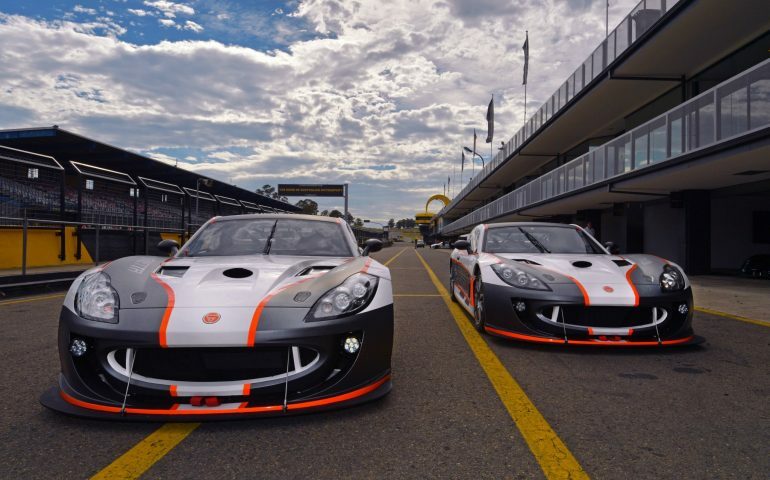 Ginetta is set to make its G55 GT4 debut in the historic Liqui-Moly Bathurst 12 Hour at Mount Panorama, Bathurst, New South Wales, Australia on 3 – 5 February, 2017. A pair of Ginetta G55 GT4 cars will be raced by a star-studded line-up in a factory-backed effort with team, RA Motorsports. Ginetta Factory Driver Mike Simpson will head up the first of a two-car entry. The British racing driver will be joined at the wheel by Australian drivers Peter Paddon and Tim Berryman. The pair each have a long history with the RA Motorsports team and are previous national champions in Radical Australia Cup. Tim took the 2014 Radical Cup title and has been racing F3 and Historic CanAm cars for the past two years, whilst Paddon took the Radical Championship title in 2015 and 2016, he also won every RAC race at Bathurst last two years. The second entry for Aylezo Ecotint Racing (AER) – RA Motorsport will be headed by Malaysian racing driver and GT4 class winner at the 2016 Sepang 12 Hour, Zen Low. He will be joined on driving duties by Bathurst’s local racing driver, Jack Parsons, who also holds the Formula Ford record around the historic circuit and Japanese racer, Shinyo Sano. A dominant force in international endurance, the Ginetta G55 GT4 claimed its fifth SP3 class victory in six years at the Dubai 24hr earlier this month. It is their commitment to the ongoing development which has seen a Ginetta win the British GT4 class six times in the nine years since the class was created in 2008. Other highlights of the past 12 months include making history in Pirelli World Challenge with rising star Parker Chase, as well as taking a first and third in class at the Motul Sepang 12 Hours. Ginetta and RA Motorsports share the same ethos of being able to offer a novice enthusiast an accessible route from entry level racing, right the way through to international competition. The team understands the need to provide a customer-focused service which caters for all level of driver skills, with a particular focus on time poor executives. Acknowledged and recognised around the world as one of the most significant GT races on the motorsport calendar, the Liqui-Moly Bathurst 12 Hour is a race for GT3, GT4 and invited production-based or specialised endurance cars.